There aren’t that many fleets that include Porsche on their choice lists. In fact, for those that do, the high-performance German sportscars, saloons and SUVs would be available only to company directors. But from September the brand could be well placed to make a greater impression, particularly among London-based businesses. It has already made its presence felt with diesel and petrol-electric hybrid versions of the Cayenne and the Panamera. The Cayenne, which is mechanically similar to the Volkswagen Touareg, offers competitive CO2 emissions and running costs with cars such as the BMW X5 and Mercedes-Benz ML, while the same powertrains in the Panamera have given senior executives access to a driver-oriented saloon in the same price bracket as BMW, Mercedes-Benz, Audi and Jaguar rivals. The Panamera Hybrid caught people’s attention as a company car because of its CO2 emissions of 159g/km, which, at launch, fell below the 160g/km threshold for enhanced capital allowances. However, changes were made in April and the threshold was reduced to 130g/km, taking many popular company cars out of contention, let along high-performance choices for senior executives. But Porsche was well advanced along the road to the next stage of its hybrid programme, and the facelifted version of the Panamera comes with a plug-in hybrid model. The Panamera S E-Hybrid comes with CO2 emissions of just 71g/km and fuel consumption of 91.3mpg on the official combined cycle. This makes it sound like an ultra-economy version but performance-wise it’s placed squarely in the middle of the Panamera range. The combined output of both petrol and electric power is 416bhp, with a maximum torque output of 435lb-ft, enough to propel the car from rest to 62mph in just 5.5 seconds. The 71g/km rating takes it out of July’s new lower CO2 limit for the London congestion charge zone, ensures it’s in 100% write down allowance territory and falls into the lowest BIK tax band, which will also minimise employers’ National Insurance contributions. Whether it will qualify for the £5,000 plug-in car grant or not is still being discussed, but this should be resolved by the time deliveries commence in September. But this is still an expensive and relatively exclusive car and should not see a significant rise in sales, although it should make Porsche much more visible to fleet operators and high-end user-choosers. A smartphone app allows the driver to check the status of the car’s range and charge remotely, as well as flash the lights or sound the horn to make it more visible when returning to it in a car park. The car will come with a free home charging unit, although the fitting of the unit will need to be arranged and paid for by the customer. The Panamera facelift is subtle: minor cosmetic changes with new headlamps, rear light clusters and bumper designs mark out the new model, although the instrument panel of the plug-in hybrid is different from other models in the range. It replaces the analogue speedometer with a dial that shows when the car is driving more efficiently and when it’s in a regenerative charging mode. It is driven through an eight-speed Tiptronic automatic gearbox, whether in electric or petrol mode. It will travel for between 12 and 24 miles on the plug-in charge (on a set test route at low speeds it actually managed more than 30 miles in our hands) when used in E-power mode, but will default to combining both power sources until the charge is depleted. Like the Volvo V60 plug-in hybrid, the Panamera can be set to recharge the battery from the engine while driving. Performance certainly doesn’t have an ‘economy’ feel, with savage acceleration from the supercharged 3.0-litre V6 combined with the electric motor when required, and only a few tenths of a second slower from 0-62 mph than the new bi-turbo V6 Panamera S.
Even on electric power alone it will achieve it in 6.1 seconds. 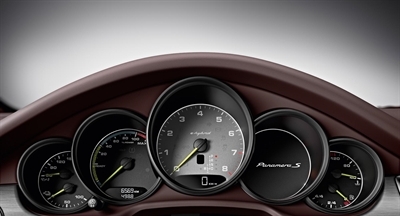 It’s refined on part-throttle when using the engine, and sounds just like a Porsche should when accelerating hard. Ride comfort is also exceptional, given the performance available: a little firmer than in a BMW 7 Series, but never jarring, while on twisty roads the Panamera makes the driver supremely confident about selecting a desired line and remaining composed. The Panamera can perform the role of a high-performance executive express as well as fulfil any low-CO2 requirements on company policies. Depreciation is likely to be competitive against other luxury saloons, but represents better value than the full-hybrid car it replaces because pricing is virtually unchanged while you get better performance and a substantial zero-emissions driving range. With CO2 emissions of 71g/km thanks to the full plug-in charge for the official test cycle, it doesn't get any better than this for high-performance cars, unless it's a fully electric Tesla. Fuel costs will largely depend on how often the driver has to resort to using the engine, but with frequent short trips catered for with plug-in charge, they should be significantly lower than other luxury cars. Probably stronger than for typical luxury saloon rivals, although with its hefty front-end price, the Panamera diesel would probably be the best bet for depreciation over three or four years. The Panamera won't be a cheap car to run, but relatively speaking it has the advantage of up to 20 or so miles per trip being powered by electricity, which is much cheaper per mile than petrol or diesel. The Porsche badge and the driving experience has great appeal, and it would stand out as a more exclusive alternative to cars such as the BMW 740d. A less likely choice for a company director than an S-Class, XJ or 7 Series, but there could be considerable cost advantages for some businesses, not least those based in London where the driver would have a relatively short commute and with charging facilities on site.